Below is how I made a Asynchronous linear induction motor which is also known as a gauss rifle or simply a coil gun at 2am in 15 minutes. After beating the crap out of an old polariod camera I picked up a few weeks back from a garage sale for $1, I noticed a few really interesting components. 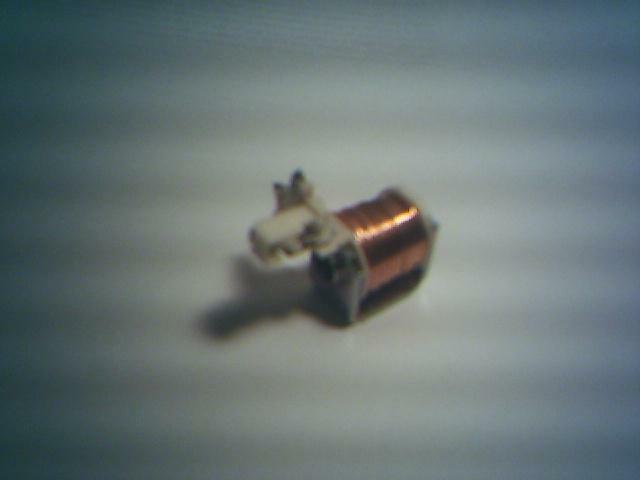 A somewhat large capacitor (409uF 350v), and a solenoid (1cm long one, very small) used in opening and closing the aperture of the camera very fast. So I did have a plan on building a mutli stage coil gun later on in the summer, but then I decided to use this for now, since it was 2am and I was sick of studying for finals needed to do something for a break. 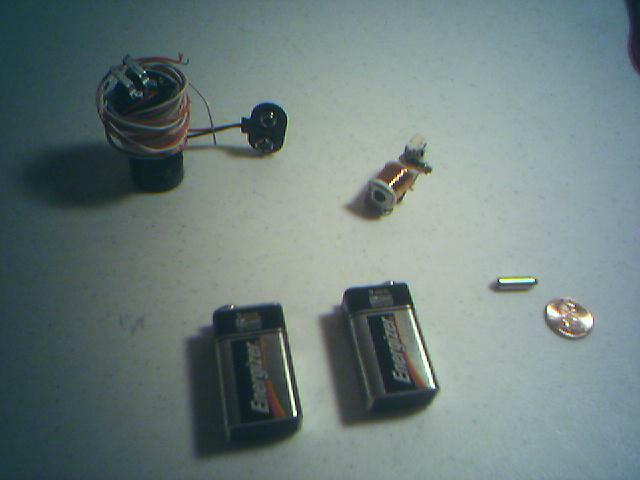 Quickly whipping out two 9V batteries (all I had) in series, and connecting them to the capacitor. Then ran two wires from capacitor ends and and connected one to the solenoid. I found a nice metal peice that fit perfectly into the solenoid, which I will use as the projectile (half diameter of a pencil, 1.5cm long, iron/steel substance, works well with magnets). For those who don’t know what a solenoid is, its a coil wrapped around many times around a plastic cylinder, and has a space in the middle where its like a small barrel, this is where that small metal projectile fits. When a current is applied to the coil, it creates a magnetic field and causes that metal peice to be drawn to the center of the solenoid. This is what they are mainly used to, to pull something to the center of the coil and hold it there until the current is no more. The capacitor is used to provide this current since it can store energy by sucking up currently slowly through the two 9v batteries, then discharging that current very rapidly again into the coil. A coil gun simply puts the metal peice a little off to the center of the solenoid, and then apply a large current to the coil. This will start accelearting the metal peice towards the center of the coil and by the time its near the center the current flow is stopped since the capacitor is discharged, so the metal peice keeps on moving (no force stopping it). In 15 minutes I had a working coil gun that shoots a metal peice across my table (2m long) and this was a large projectile compared to the size of the coil. where the projectile was about 1⁄4 size of the coil. I will post more pictures when I find my actual camera, not this phone camera as you can see quality is not the best, and most probably after my finals are over as well.